Introduction: With winter upon us, the idea of sitting down to a family meal of venison is becoming an increasingly attractive prospect, and the appeal of a game supper was not lost on our Anglo-Saxon ancestors. Whilst hunting was rare in Anglo-Saxon England, as I mentioned in the last issue of Deer, it was probably the very infrequency of the activity that gave it a considerable social importance. Think of our Christmas turkey: it is not something we eat very often but this is part of the reason it is such an iconic festive food. Unfortunately, our ability to understand the meaning of hunting and game consumption in AngloSaxon England is restricted by a general lack of evidence, as there are few historical documents to shed light on the period, hence the term ‘Dark Ages’. This is where archaeological investigations, especially the evidence from animal bones, become particularly important, because they can provide real insights into the methods by which game was procured, distributed and eaten. 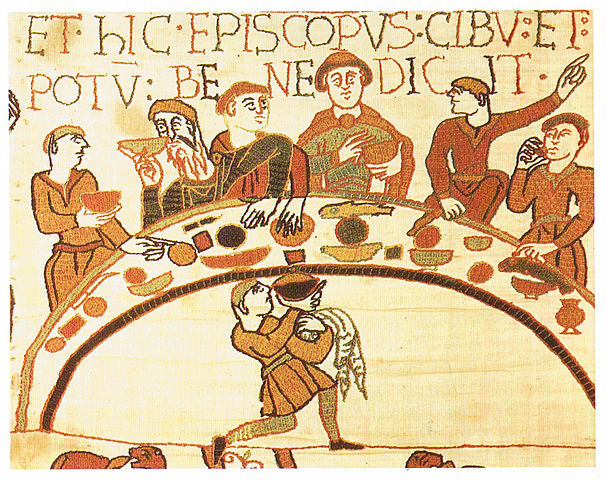 Studies of archaeological animal bones demonstrate that in the very early AngloSaxon period (5th to mid-7th centuries AD) game contributed little to the diet, which is unsurprising at a time when most people were too preoccupied with farming to engage in hunting. Archaeological excavations of settlements of this date tend to produce large quantities of cattle, sheep and pig bones but the remains of deer and other wild animals are noticeably absent. Figure 1 shows that, on average, wild mammal bones make up just 0.4 percent of the total animal remains recovered from archaeological excavations. Because of their scarcity, it is difficult to be certain how these wild animals were captured or subsequently butchered. There is, however, just sufficient evidence for deer to demonstrate that, once caught, their carcasses were dressed in the field, with ‘low utility’ portions (heads and feet) being left at the kill-site and only the meat-bearing portions being brought back to the settlement. Given that the body part pattern for the high status, palatial complex at Wroxeter is almost identical to the patterns for standard Early Anglo-Saxon settlements, it would seem that this method of field butchery was adopted by all sections of society. It suggests a logical, functional attitude to hunting and this, together with the general lack of evidence for wild animal exploitation, indicates that hunting may have been a simple, occasional subsistence activity, undertaken only in times of need. Certainly this idea finds support from the one documentary source that we do have for the period: Bede the Venerable’s History of the English People, which was probably completed around AD 731. In this text, Bede suggested that the departure of the Romans resulted in social and economic collapse, with people resorting to hunting in order to avoid starvation. The scarcity of wild animal remains in the archaeological records suggest that Bede must have been exaggerating somewhat but even if deer were viewed as a famine food in this period, over the course of the following centuries the situation changed as hunting became more common and socially significant.